There are very few things that are as frustrating as cleaning all day and not seeing the fruits of your labor. We find this especially true when cleaning your tubs, sinks or toilets. You may use every conventional cleaner out there, but if you have rust stains, you need to think outside the box. Rust stains appear when there is iron present in your water. Not to give you too much of a chemistry lesson here, but when iron meets oxygen, the iron oxidizes and creates that rusty red color that you may recognize. You’ll want to be careful using any cleansers that have bleach in them. The bleach reacts with the iron and supercharges that stains, making them even harder to remove. Going to town with abrasive cleansers can damage your appliances making it easier for particles to get caught in grooves and create build up. We recommend a solution of 1 part vinegar and 1 part water. Use this solution with a hard bristled brush on the offensive stains. We have also used three parts baking soda to 1 part vinegar. Use this like you would any powder cleaner. If you are still having a hard time with those rust stains, you can use a pumice stone. These porous stones are great at gently but effectively removing rust stains. Just wet the stone before you use one in your bathroom or kitchen appliance. Finally, you can use a product called Bar Keepers Friend. This product is known to restore not only appliances but pots and pans back to their previous luster. Ultimately, if you want to get rid of rust stains, you need to address the source of the problem. If you live in an older home and have old pipes, they can have rust deposits. 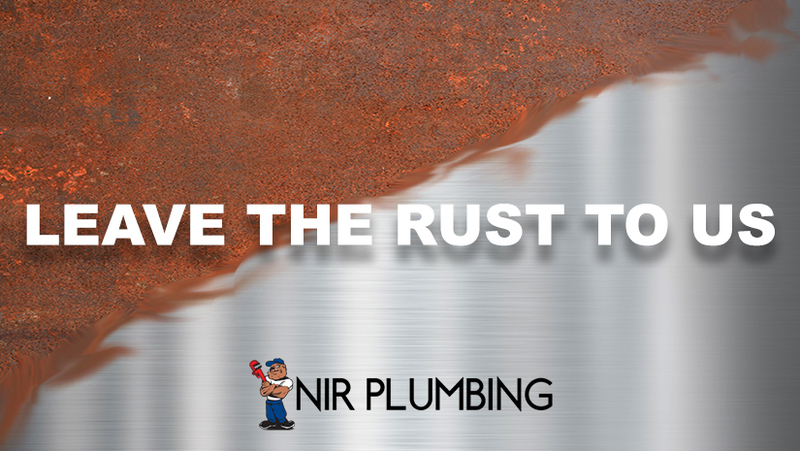 Changing your piping is a significant process, but not if you have NIR Plumbing on your side. We can walk you through all the different options available to you as well as install quickly and affordable. Talk to us today about your plumbing options.